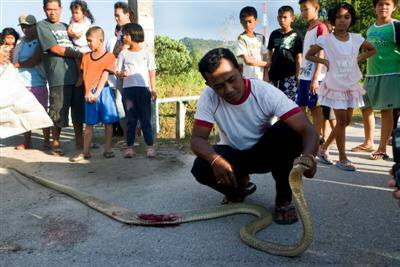 PHUKET TOWN: A cobra trying to cross Thepkrasattri Road in Thalang got crushed by oncoming traffic late yesterday afternoon. Estonian freelance photographer Ardo Kaljuvee, who happened to be driving past at the time, was among the many motorists who stopped to view the remains of the flattened serpent, which was at least three meters in length. The snake’s final slither took place at about 5pm on the stretch of Thepkrasattri Rd near the Susco gas station in Muang Mai, Mai Khao. “About fifty people gathered to look. It’s the biggest snake I have ever seen,” said Mr Kaljuvee. Do you have any interesting photos? Send them with captioning information to [email protected] and share them with the world as a citizen reporter.